… And what to do about it! 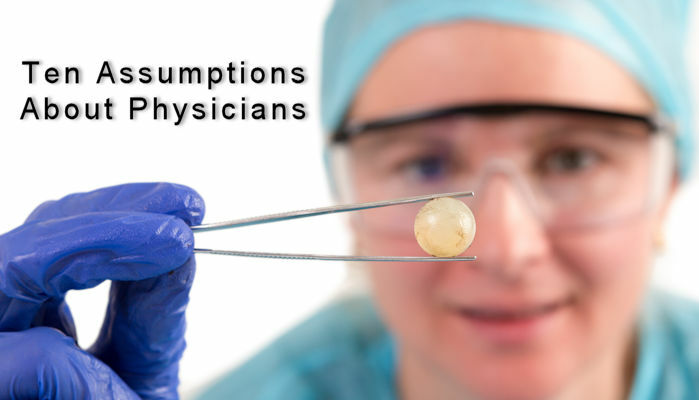 with them and hospital administrators have developed assumptions that they see as facts that cannot be altered. Do any of these sound familiar? 1. They are super-human and should have it all together. Physicians are intelligent, educated, hard-working. They live in big houses and drive fancy cars. Life seems sweet, right? Wrong! Perhaps more than most people, physicians are LESS likely to “have it all together.” They had to put their personal lives on hold to make it through medical school, and again to get ahead professionally and pay down their enormous education debts. Their personal life and well-being always come second. Consequently, physician suicide and divorce rate is higher than the norm. They are victims of burnout. And their problems become YOUR problems when their meltdowns affect patient outcomes, everyone’s morale, and your institution’s reputation and bottom line. In fact, physicians often need MORE help, not less, when it comes to handling the part of their life that doesn’t involve wearing a white coat. They need programs, tools and strategies before their conflicts bleed over into the hallways where you work. 2. They are efficient at everything they do. Physicians are highly-strung people who rarely like anyone to tell them how to run their practice, let alone make suggestions on how to increase efficiency. At the same time, many struggle with time and performance issues. The reason is that many physicians are caught up in the doing without ever reflecting whether certain non-clinical processes could be streamlined, delegated or simplified resulting in wasted hours and mounting frustrations. An ob/gyn I worked with lost about 14 minutes every time she had to schedule a patient for surgery: 7 minutes to walk the patient through the hallways to the administrative office, 7 minutes to walk back. It had never occurred to her to delegate this task to a staffer. Such a small change made a huge difference in her ability to leverage her time. She put up with this inefficient habit for so long that she never thought a solution was possible. Just imagine how much money your hospital could save if all your physicians worked on just one area of efficiency! 3. They have a superiority complex, so it’s hard to work with them. One big friction in hospitals these days is the battle between doctors and hospital administrators who feel that it’s like pulling teeth when it comes to working together and collaborating. It’s easy to blame this on a label: doctors are just so difficult to work with. Physicians are clinicians with no (or very little) business skills. That’s what they’re trained in. Words like “collaboration” and “teamwork” are foreign to them, and communication means “order and command.” They look at healthcare through their clinical lens, and do not acknowledge the hospital perspective or business perspective; they developed tunnel vision at times. A rheumatologist used to be ordered to the HR department of her hospital frequently. She had run-ins with her nurse that impacted the patient care and she constantly and openly complained about the administration. Coaching her on improving her emotional intelligence allowed her to keep her reactions more under control and to look at situations from a different perspective. 4. They are born with a lousy bedside manner. Actually, many of them were TRAINED to act that way. They were also NOT trained to act any other way! In school, they took complicated technical subjects, but there was nothing in the curriculum on “Bedside Manner 101.” Once they entered residency, they were surrounded by dreadful role models in the form of the previous generation of physicians who ALSO did not get much training. Now the bad behavior is modeled directly for them by the kind of professionals they hope to become. Bad bedside manner affects more than just the patient in the bed. When coupled with doctor error, it makes lawsuits more likely. It hurts everyone and makes YOUR job harder. You have two choices: Continue to suffer and pay the price, or institute programs that offer these physicians communication training and positive reinforcement no one ever bothered to give them before. 5. They are supposed to be friendly and balanced. You and your patients expect physicians to be friendly, balanced, and patient every day. After all, their behavior and demeanor have the greatest impact on quality of care, patient satisfaction, patient referral, and even legal malpractice likelihood. Healthcare is an emotionally loaded and intensive environment where precision and performance decide over life and death. Many physicians work 80 and more hours each week dedicating most of their life and their well-being for the well-being of their patients. However, that personal sacrifice has its tolls and brings irritability, tiredness, and medical errors. A pediatrician was asked to work with me in consequence of her rude behavior towards her staff and decreased performance. Each day she worked 11 hours in the practice and spent additional 2-3 hours each night at home charting with the new EMR system. The friction with the family and the lack of self-care impacted her mood and performance. Through our coaching, she became more efficient with her charting, adjusted her schedule, and streamlined certain processes. As a result, she moved up in her performance and reduced her charting time at home to less than an hour leaving her more time for family and exercise. 6. They are people persons. Many people think that physicians are people persons. After all, as a practicing physician, they spend their time with patients all day. Reality is physicians love to make a difference in their patient’s lives. They live for their patients, they want to help their patients and they work long hours for their patients. But that doesn’t make them people persons who can easily relate with and communicate with other people. After all, medicine is a science and many physicians studied medicine because they are intrigued by the science behind it. They are unaware of how they come across to patients and how their attitude is impacting the performance of their staff. My experience working with physicians has taught me that – with the right approach – they are eager to learn more effective ways of being, communicating, and leading. 7. They don’t need work-life balance. Medical school and residency training are tough life phases that young students have to go through in order to become a doctor. Therefore many hospital administrators and doctors assume that they can easily continue this hard pace of working and living. Being a physician – no matter what specialty – can be very stressful. Physicians are human beings like everyone else with limited capacities. Recent studies have shown that more than 50% of all physicians experience burnout, the successor of on-going stress, overwhelm and pressure to an extent where it affects their professional performance. Effective, compassionate and successful physicians are role models of work-life balance and leadership. They know that their well-being and their behavior have an impact on the well-being of their patients and the well-being of their staff. What patient is following the doctors’ prescription of “take it easy and get some rest” when the doctor looks exhausted and burned out. 8. They make a lot of money. Many people think that physicians have a lot of money. After all, salaries are in the 6 figures no matter what specialty. The reality is even though physicians seem to make a lot of money they also spend a lot – and they deserve it. They start making money later in life than other professionals and by then they accumulated a lot of tuition debts that need to pay off. Consequently, they put their lives on hold for many years and as soon as they are making money, they want to enjoy the better side of life. Chasing a high-end lifestyle with little quality of life adds tremendous pressure and anxiety. It impacts their quality of care, their attitude and behavior. Anger management is not always the solution for bad physician behavior. Many times disruptive behavior is the symptom, and the source can be financial or personal issues for the physicians. 9. They are not team players. One of the central tenets of the patient safety movement is that modern medicine is a team sport. Unfortunately, its players – particularly physicians – were trained and socialized to be independent, free-spirited individualists. Teamwork typically requires different kinds of planning, training, and practice than what most physicians have been accustomed to in medicine. It needs to become the standard, not the ideal. They need to become the leaders in the effort to instill teamwork where they practice and do right by your patients. They cannot see themselves as isolated any longer and they need to see themselves as part of a team. That is a mindset that can be taught and it will mean more training and education on collaboration, communication and coaching skills. This change is proposed to benefit patients and increase efficiencies for all. Leadership is behavior and not a position. Ideally, physicians ought to be leaders to the staff, with their patients and in the community. But their responsibilities and the “MD” behind a name doesn’t make them necessarily natural leaders. I’ve met physicians who were excellent clinicians and mediocre leaders. I’ve coached physician leaders who struggled to produce intended results. Their leadership paradigm that works in the clinical setting doesn’t work in the administrative setting. Physician leadership is not only about administrative knowledge and business results but also personal leadership, emotional intelligence, and team development. Leadership is taking care of the people that they are in charge of, so together they can accomplish the desired results. These are skills that I enjoy teaching physician leaders. With all the ongoing changes that are happening in healthcare, physician behavior, collaboration and alignment are critical for a hospital’s bottom line and require a new mindset and different training. Iris Grimm coaches physicians to advance their leadership skills and performance in record time. For more information, visit www.cultivatephysicianleaders.com. She can also be reached at 770-428-2334.